I subscribe to a quote, written by the conservative icon William F. Buckley Jr., as a litmus test for anyone I encounter who still purports that there is any value in increasingly obsolete, outdoor, roadside billboards. There may be an exception, but billboard company execs don’t like to live in neighborhoods with or near billboards. Fearing backlash from neighbors they usually reserve the big boards for poorer neighborhoods instead. In the essay, Buckley also challenged Libertarians, the most conservative of conservatives to take on what he saw as an abuse of the argument for the principle of private property by billboard companies. Often billboard companies buy or lease property to erect a billboard that is behind a grove of pre-existing roadside trees and then apply for a permit to cut them down, arguing the right to be seen. In my opinion, billboard companies are not really free marketers, they are more like freeloaders, paying little in fees and less than the cost of a couple of steak dinners in annual property taxes. They weasel out of compensating the public for the trees they destroy, if not exempted entirely such as was done for them by recent legislation passed in North Carolina. Most egregious is the fact that they pay nothing for the scenic easements they destroy. Economists view these companies as rent seeking because rather than creating value, they use campaign contributions and lobbying to secure gratuities along public roadways that they didn’t pay to create. Courts call this parasitic, but lawmakers seemingly blinded by cash and strong-armed in the hallways of the legislature, have yet to prioritize the electorate’s right to a view of nature along public roadways. 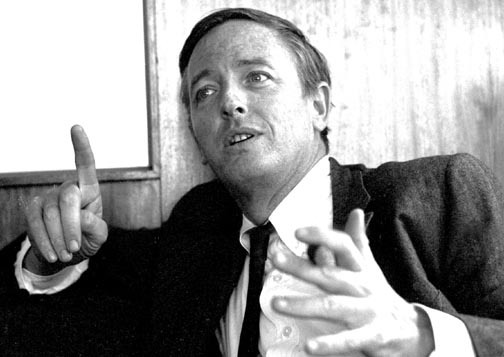 I am a moderate and an Independent but I miss Buckley and the thought-provoking stimulation of his essays in the National Review as well as the wit he exhibited during interviews on his long-running television talk show, Firing Line. To me Buckley represented the now nearly extinct traditional conservatives so eloquently described a few days ago in a column in the New York Times by David Brooks entitled The Conservative Mind. Ironically, Buckley and Russell Kirk, who are credited with giving form to modern conservatism following World War II, and the late President Reagan who also represented a more diverse and thoughtful conservatism, might be excommunicated by today’s conservatives. One thing is for sure: Locked in “polarized political conflict with liberalism” as Brooks writes and with seeming disdain for mutual respect or the common good, those who dominate today’s conservatism make it incredibly difficult to remain a moderate. However, whenever I find myself tempted to tune out today’s robotic conservatives and shift away from my moderate comfort zone, I reread the Ten Conservative Principles by the late Russell Kirk, who lived in Durham, NC, where I now live, in the 1940s as a graduate student at Duke University and whose 1953 Ph.D. dissertation “The Conservative Mind – From Burke to Eliot” was published as a book. If you are a liberal or a moderate like I am, or a conservative who is dismayed by today’s robotic brand of conservatism, reading Buckley and Kirk is a way to regain perspective and appreciation and understanding for the best in that ideology.